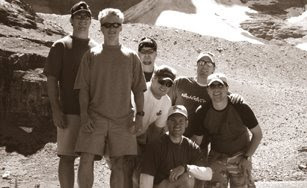 For the past five years I have annually gathered with a group of my college buddies (see above photo from last year’s trip to Banff, Canada) for a handful of days. We call it Fandango. There’s a long story behind it that I’ll save for another time. Suffice it to say, Fandango is one of the highlights of my year. I get to spend some real time with real friends – men I have known for twenty years. This year we will be spending Fandango in St. Louis, home to one of our ‘Dango crew. I’ve never been to the ‘Lou but am so looking forward to it. My excitement flows from not only visiting a new city but reconnecting with old friends. Frankly, we could have this in Backwater, U.S.A. and I’d still have the best of times simply by hanging out with these brothers. I leave this Monday and return, God-willing, on Friday. Hopefully I’ll have some stories to tell when I get back. I pray God’s grace will be rich to me and my ‘Dango boys as we share koinonia throughout the week.